Order now and receive free freight! Every CONFAST® Zinc Plated Wedge Anchor is in stock for immediate shipping. The Zinc Plated CONFAST® Wedge Anchor can be installed in solid concrete in a dry or mildly corrosive condition, where moisture is at a minimum. They are available in diameters from 1/4” to 1-1/4”; each diameter is manufactured in different lengths to accommodate varying thicknesses of material to be attached to the concrete. Each box of Zinc Plated CONFAST® Wedge Anchor is packaged with the correct number and size of nuts and washer. The bit diameter required for drilling the hole in the concrete is equal to the diameter of the Zinc Plated CONFAST® Wedge Anchor being installed. 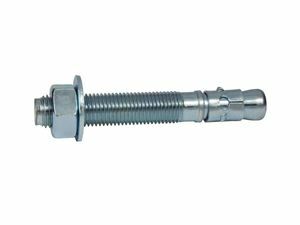 When installing the Zinc Plated CONFAST® Wedge Anchor, a minimum of 3 to 4 threads must be below the surface of either the material being fastened or the concrete. Zinc plated carbon steel is designed for indoor dry applications, and will rust if installed in wet moist atmospheres. Hot-dipped galvanized or stainless steel CONFAST® Wedge Anchors are a better choice if the application is in a wet or moist environment. The hole in the concrete for each diameter of CONFAST® Zinc Plated Wedge Anchor is equal to the designated diameter of the anchor being installed. For example, a 3/8" anchor requires a 3/8" hole. If the zinc plated wedge anchor is installed through a hole in the item being fastened to the concrete, then the hole in that items needs to be larger than the designated diameter of the anchor being installed. Technical Information can be located by clicking on the blue link TECHNICAL INFORMATION. This page will display a complete description of the Zinc Plated Wedge Anchor, including pull-out and shear values in 2000 PSI concrete as well as other necessary information required before making a purchase decision. A short video may be viewed and step-by-step instructions may be read or printed that will describe the correct installation procedure for the wedge anchor in solid concrete. The attribute filters can be used to quickly locate the exact product needed. Select the diameter, length, and type needed, and then click on the results for the individual product page. The individual product page will display complete information and detailed descriptions for that specific product.